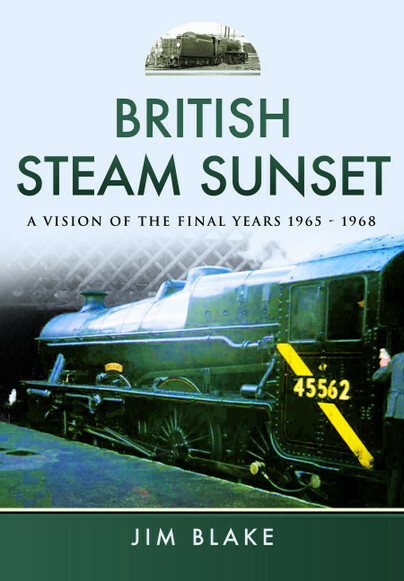 You'll be £15.99 closer to your next £10.00 credit when you purchase British Steam Sunset. What's this? In this new album from Pen & Sword, transport historian and photographer Jim Blake presents a selection of pictures he took around the country in British steam's final years. British Railways withdrew their last steam engines with almost indecent haste in the mid- to late-1960s, many having seen only a few years' service before consignment to the scrapheap. Jim's pictures graphically show how not only the locomotives themselves were neglected in their final years, but also their working environment. Their motive power depots were also badly run down, particularly when slated for closure upon steam's demise. Most of Jim's pictures of steam locomotives, taken fifty years ago, are previously unpublished. In BR steam's last two years, they were based in two distinctly different areas on the London & South Western main line, and in the industrial north. However, their decline was just as sad and depressing in both areas once proud depots such as London's Nine Elms, with broken windows and roof open to the sky, not repaired after wartime, piles of ash and clinker everywhere, were just as derelict as those in such places as Wigan or Sunderland. Many scenes herein invoke the sad, eerie atmosphere of steam's last months. Ironically, it was London Transport who operated the last publicly-owned standard gauge steam locomotives in 1971, some three years after BR's had gone. These are included within these pages too. Like many young lads born in the early post-war years, Jim soon developed a passionate interest in railways including the myriad steam engines that were still the norm on the rail network in those days. The results are all here in this nostalgic coffee table book, a steam enthusiast’s dream if I ever saw one. Here we have engines imbued with personality. Unintentional religious imagery abounds; thus we have the “last days” and “death” of steam, even purgatory – if the famous Barry scrapyard counts as that – and resurrection (steam on preserved lines). An evocative piece of railway history.